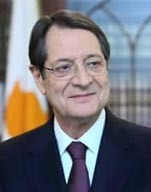 Mr Nicos Anastasiades was inaugurated President of the Republic of Cyprus on 28 February 2013, following his victory in the Presidential Elections of 24 February 2013. At the time of his election to the Presidency Mr. Anastasiades was a member of the House of Representatives where he served since 1981. He was also serving his fifth term as President of the Democratic Rally (DISY) political party, a position he was entrusted with by the members and officials of the party since his first election in 1997 and re-election in 1999, 2003, 2007 and 2012. He resigned from that position after his election to the Presidency of Cyprus and was declared Honourary President of DISY in May 2013. Since 1995, he has been a member of the National Council (the top advisory body to the President of Cyprus on the handling of the Cyprus Problem). During his long tenure as a member of the House of Representatives he served as Chairman of the Committee on Foreign Affairs, Chairman of the Committee on Educational Affairs, Chairman of the Inter-Parliamentary Committee on Foreign Affairs until 2006, as well as Vice-Chairman and member of many other Committees. He was also elected Vice President of the House of Representatives for the years 1996-2001 and served as Parliamentary Spokesman of the Democratic Rally. He is a founding member of the Youth of the Democratic Rally (NEDISY), which he served from the posts of District Secretary, Vice President and President. After his successful tenure at NEDISY, he became actively involved at a higher level, first as First Vice President and later as Deputy President of DISY until 1997, working closely with Mr Glafkos Clerides, the founder and leader of DISY and a two-term President of Cyprus. Throughout his political career Mr Anastasiades has been an active and energetic participant at the international political level. He represented the Cyprus Parliament internationally since 1991 in his capacity as Chairman of the Parliamentary Committee on Foreign Affairs, as Head of the Inter-Parliamentary Committee on Foreign Affairs as well as Head of the Cyprus delegation to the Inter-Parliamentary Union (IPU). He also participated in a number of international parliamentary missions, specialised conferences and visits to many countries. Following his election as President of the Democratic Rally he participated in all the European People’s Party (EPP) Summits and Conferences, he represented the Democratic Rally in the European Democrat Union (EDU) and was actively involved in all the conferences of the International Democrat Union (IDU). His regular presence and interventions during summits and conferences have strengthened the positions of the Democratic Rally in these political groups. At the same time, through the interpersonal relationships he had developed, he was instrumental in having the political positions of these groups on the Cyprus Problem coincide with the positions of the Greek Cypriot community. President Anastasiades studied Law at the University of Athens and pursued postgraduate studies in Maritime Law at the University of London. He practiced law since 1972. He is fluent in English. During his student years in Athens he was an active member of the Youth of the Centre Union political party. After finishing his studies, he completed his military service in the National Guard. He was born in 1946 in Pera Pedi, in the Lemesos (Limassol) district. He has a twin brother and a sister. Mr Anastasiades is married to Andri Moustakoudi and they have two daughters, Elsa and Ino, and four grandchildren.